It takes a special kind of man to be awarded the Victoria Cross – the highest military honor bestowed by the United Kingdom and Commonwealth nations. It takes a special kind of man to capture over 100 enemy soldiers. It takes a special kind of man to continue fighting after being shot and then go on to defeat more than 70 men. It takes a true legend to do all three. Colonel Thain Wendell MacDowell was such a legend. Colonel MacDowell was born in Lachute, Quebec, and had a fairly quiet early life. He played hockey, and in college at the University of Toronto, even led his team to a national collegiate championship. He also showed an interest in the military from an early age. In high school he joined the 41st Regiment (“Brockville Rifles”). 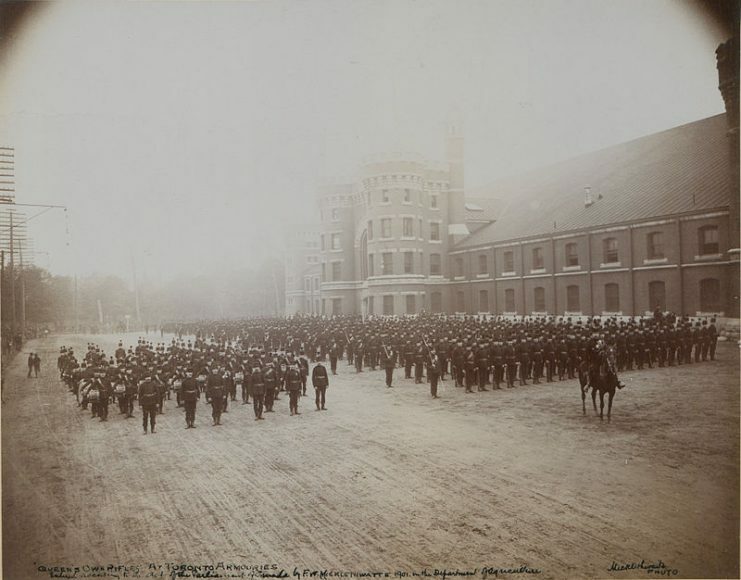 While at the University of Toronto, he joined The Queen’s Own Rifles of Canada. He graduated in 1914 – just in time for the war. Queen’s Own Rifles at Toronto Armories. MacDowell soon found himself bogged down in the Battle of the Somme. But he would rise to fame for his actions at the very tail-end of the ultimately indecisive battle. On November 18th, the Canadians were advancing on Desiré Trench through blinding sleet. MacDowell got separated from his men and soon found himself face-to-face with three German machine gun nests. Dodging machine gun fire, he jumped into the trench. Due to the low visibility, the Germans were unable to determine who or what exactly had just entered the trench. The soldier nearest to MacDowell certainly didn’t even have a chance, as MacDowell kicked him in the face while executing his jump. 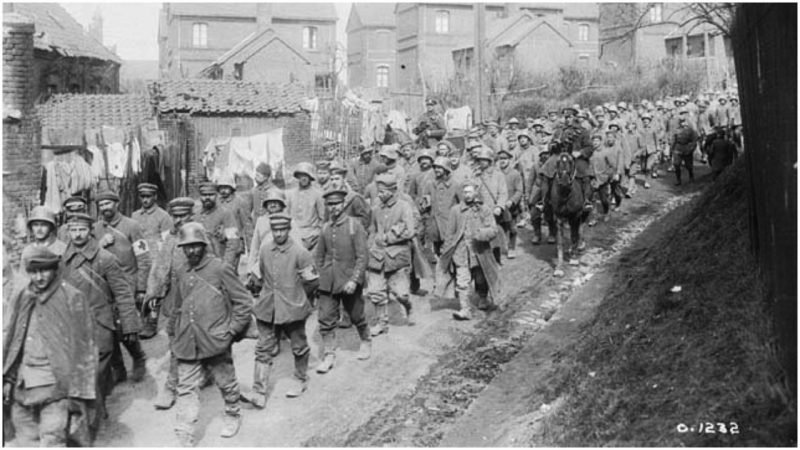 After killing three more Germans in the trench, the rest surrendered to MacDowell. This included three officers and 50 additional men. More Canadians soon arrived to help secure the prisoners. MacDowell was rewarded for this feat with the Distinguished Service Order and a promotion to Major. 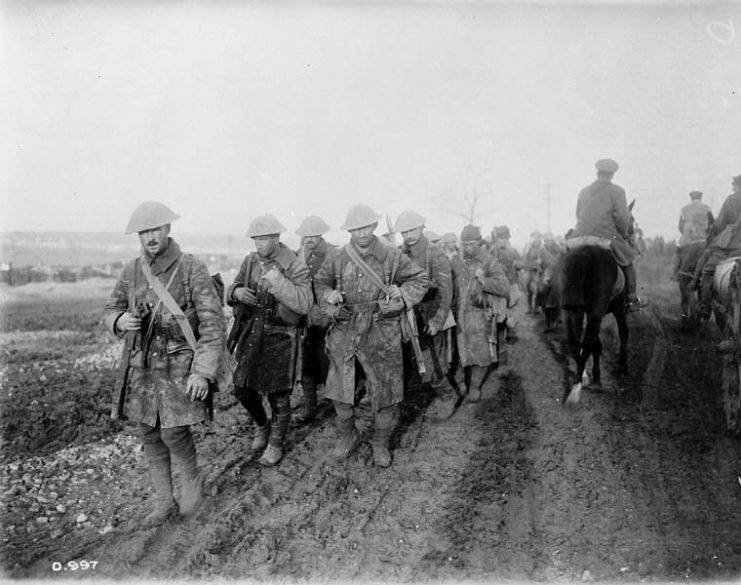 Canadian soldiers returning from trenches during the Battle of the Somme. However, MacDowell had been wounded in the combat. In fact, it’s likely that during the fighting he suffered several concussions. At one point, he was thrown through the air by an artillery shell that had landed near him. After spending some time in London to recover from his injuries – both physical and psychological – MacDowell was sent back to the front lines. In April, MacDowell and his company were sent to take part in the Battle of Vimy Ridge. While charging the enemy lines, he and two runners were separated from the rest of their company. 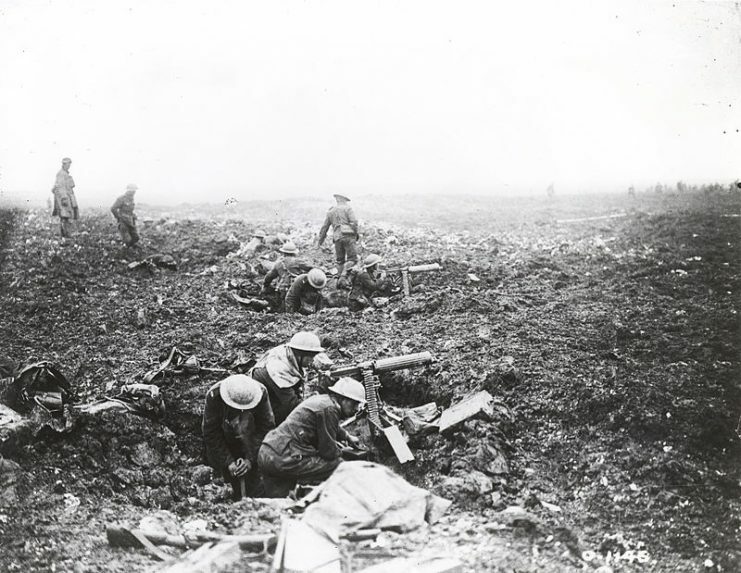 The entire battle was extremely chaotic, as around 1,000 pieces of Allied artillery were firing on the German positions as the Canadians advanced. MacDowell soon found himself face-to-face with German machine guns once again. He used several grenades to destroy the two machine gun nests he encountered and came across a German bunker. Battle of Vimy Ridge. Canadian machine gunners operating from craters on the plateau above the ridge. This is where most men would admit they were outgunned and fall back to wait for reinforcements. But Thain MacDowell was not most men. After finding a ladder into the bunker, he ordered his runners to stay up top while he descended into the German lair. When he reached the bottom, 50 steps later, he found no less than 77 armed Germans staring him down. In a brilliant split-second decision, he shouted up the ladder for this “3rd and 4th Corps” to come down the ladder and begin their assault. It was then that no less than 77 Germans dropped their weapons and surrendered. MacDowell divided the Germans into groups of 12 to send them out of the bunker. He knew that they could overpower him if they all discovered his ruse at once. He had his runners walk each group of prisoners back to Canadian lines while he guarded the rest. One made a break for it but was shot dead. As if this was not enough, MacDowell continued to hold the position, even while wounded and under artillery fire, for five days. Ultimately, the battle was won, and the war ended soon after. 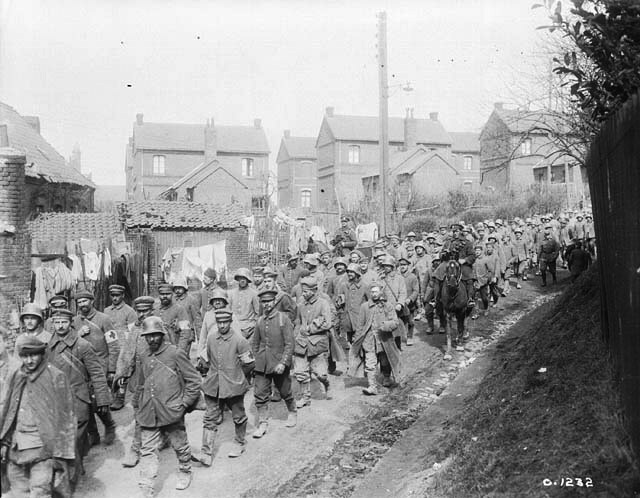 German soldiers captured during the battle. After capturing dozens of Germans not once, but twice, while severely outnumbered (or alone) MacDowell was awarded the Victoria Cross and promoted to Lieutenant-Colonel. The two runners with him were awarded the Distinguished Service Order. “For most conspicuous bravery and indomitable resolution in [the] face of heavy machine gun and shell fire. By his initiative and courage this officer, with the assistance of two runners, was enabled in the face of great difficulties, to capture two machine guns, besides two officers and seventy-five men. 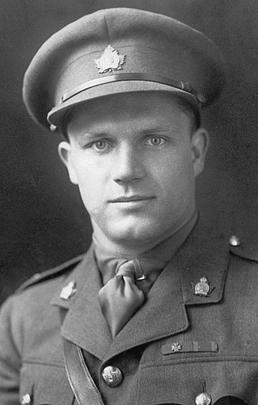 As the only Canadian to receive the Victoria Cross for his actions at the Battle of Vimy Ridge and survive the war, MacDowell returned home a hero. However, what he had seen left a severe impact on him. In addition to being shot in the hand, he had suffered several concussions and had seen horrors he could not forget. For the rest of his life, Lieutenant-Colonel MacDowell would suffer from bouts of Post-Traumatic Stress Disorder. Although his actions were heroic and his bravery unquestionable, his experience stands as a stark reminder that war does not care who it harms.